I came across this article on The Telegraph yesterday by Nigel Donnelly. 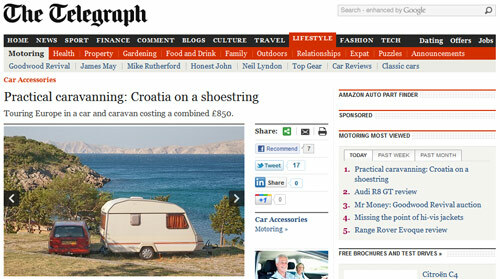 To summarize, it’s an article about “caravanning” on holiday. Nigel and his wife jam through several countries before entering Croatia and naturally, that’s where the “adventure” begins. That made the contrast of Croatia even more stark. We needed passports and paperwork to get across the border for the first time on the trip and all the English signage evaporated too. We had to get some Kunar too as Croatia hasn’t adopted the Euro. Actually, they would have needed passports to enter France as the UK is not in Schengen and as for “English signage”, I would think that would have disappeared once they left England. Also, the reason that Croatia is on the kuna (not Kunar, which is something I have to attribute to some English speakers adding an “r” to “a”-ended words) is that they’re not even in the EU yet. The way he words all of this is bizarre and seems to be wanting to affect some tone of rugged travel in what is a very easy and comfortable country to enjoy. The rough Croatian wine got better the more we drank and we talked excitedly about the sites, the long driving days and a hundred other things we’d enjoyed. Wha? The only way that this would make sense is that people who are caravanning are doing it to save money and thus, he stopped off at some VinoRakijaMan and picked up a cheap wine alongside the road. In which case, I hope he was hungover the next day as he felt the need to put forth a snarky comment about the wine. While Croatian wines are obviously of varying levels of quality, most of what you’ll find properly bottled and labelled is at worse okay and at best outstanding. Or, maybe he just doesn’t like wine. Whatever the case, this article reads more like someone trying to make a couple of bucks on trying to take a cheaper holiday than someone who was actually out to explore.